I haven't installed it yet, but I thought I'd post some photos/first impressions of the SAM-1 Range Hood Fan Upgrade kit from Fabulous Operating Products. Along with a couple minor mods, I installed the SAM-1 Conversion today. No wonder the tin box couldn't vent air. You should see what poor quality is was. Anyway, the SAM-1 moves alot of air at three different speeds, and is very quiet. The LED strip that's built in has low and high. High is very bright, and low is suitable for a night light. I'll post some photos and installation details tomorrow, but for now, I'm tired. Here's a photo of the old tin box I removed. Not even a "box", just three sides of flimsy sheet metal and a pitiful (but noisy) fan. Some photos of the fan installed. First with the light on low, second with the light on high. Another of the new exterior vent. The exterior vent does have to be trimmed so the flange that protrudes inside is only 1/2" - just like Escape did with the original Ventline vent cover. That's because the walls are very thin and the vent covers are designed for 1 1/2" or so of wall thickness. The amount of air this moves is impressive. If you stand outside anywhere within 6 feet of the vent, even on low, you can feel the exhaust air blowing on you. Super quiet too. The wiring was a bit tricky, but Larry at F.O.P. is great and he walked me through it in a minute or two. He supplies a wiring harness with a plug on one side and crimp connectors on the other, so all you have to do is make sure the light wire, the fan wire, and the ground wire are crimped on the right color wire on the harness. The hard part is re-installing the hood and getting the screws to line up. All in all, very satisfied with this product. It looks like yours original hood was one of the ones that has the re-circulation type hood. It's a loosing battle. Half the air moved by the fan comes right back into the interior and the other half isn't enough to force the flap open. It's not so much that the fan is pitiful, it's the design. Simply putting tape over the unneeded and unwanted opening (where the stick is protruding) made the difference between it being able to open the flap without it having to be pinned open. Your mod is a definite improvement in some ways but for those who don't want to go to that length and expense a little tape will improve the situation. Looks like the kit is a pretty good product, good install. 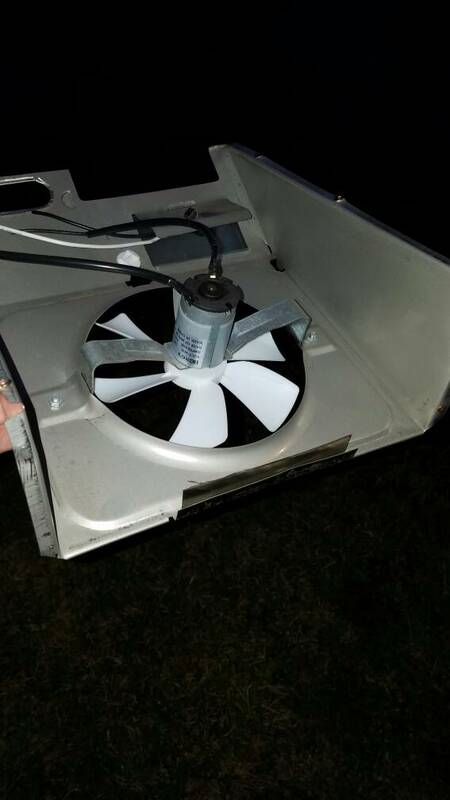 If you cook inside all the time and the fan doesn't really work then might be worth $200 for the upgrade kit. Our fan works pretty well, no charcoal filter was in it from ETI, and we hardly ever cook inside so not a mod that would make our list. Ours was taped too Ron - some shiny silver tape over the hole. I just removed it before I took the photo. Still, not enough air volume to open the flap. We also nixed the charcoal filter and the vent would open about half way. It wasn't just the venting though, but the noise. This new fan moves about 10 times as much air as the old one when it's set on low (has 3 speeds). Even on high I'd say it's about 80% quieter than the stock fan. This mod may not be for everyone, but it's a definite improvement.